Then ... After the movie Yvonne leaves the Roxie Theater not expecting her husband Homer, out drinking with his buddies, to pick her up. 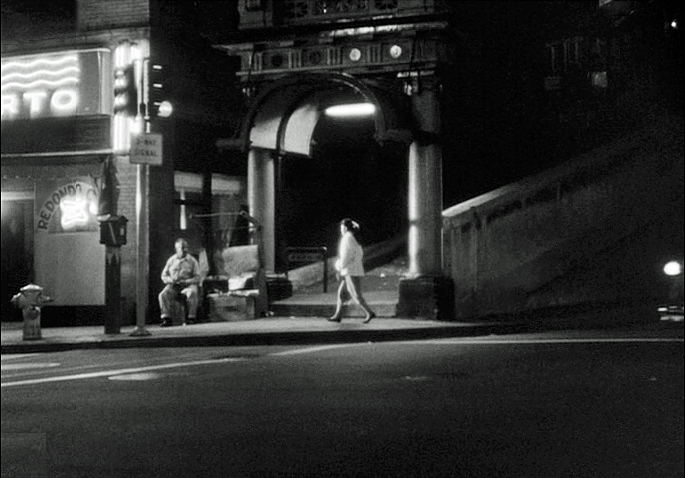 She heads to a girlfriend's place and as we shall see, her route through town jumps all over the place as director Kent MacKenzie chooses locations that look good onscreen in high contrast black-and-white. ... and Now, the dilapidated theater, at 518 S. Broadway, speaks volumes about the fate of this formerly resplendent theater and the downtown neighborhood around it. No longer playing movies for the public, its lobby now sells bargain clothes. But the mosaic sidewalk pattern lives on. Then ... On the way she browses at a department store's street-side arcade. 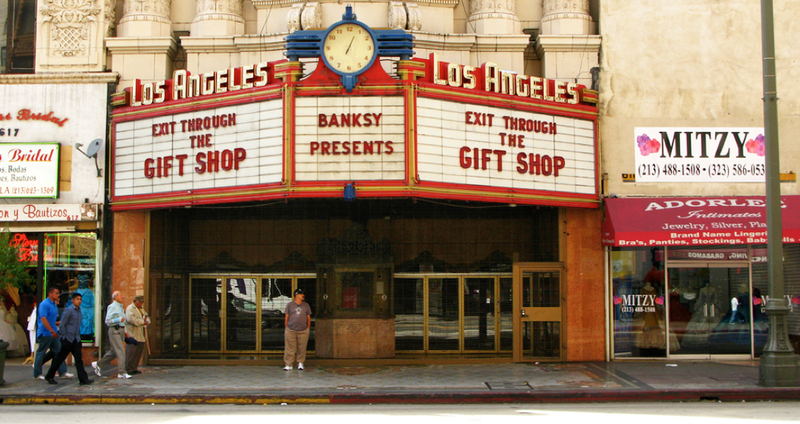 Opposite is the flashy marquee of the Los Angeles Theatre at 615 S. Broadway. The stores next to it are Eastman Linens at 611 and Mode O'Day at 609. ... and Now, here's the same view across the street to the theater; it's still in business. ... in 1939 ... The store where she window-shopped was Desmond's at 616 S. Broadway, seen in this vintage photo. ... and Now, the venerable store now has unused upper floors and several retail stores on the ground floor level, including a Payless Shoe Source branch. Then ... Next she goes by a parking lot and the Brass Rail, a well-known gay bar, part of the circuit known at that time as 'The Run'. ... c. 1960 ... both the Brass Rail bar and the parking lot can be seen in this vintage photo - the bar was at 334 S. Hill Street (the Grand Central Market is just off the left edge of this image). ... and Now, the two buildings on the left above are gone but at the site of the Brass Rail today another dive bar sits in its place - La Cita. Then ... Here she passes a doughnut store. In voiceover she tells how she always wanted to get away from her people on the reservation and is glad to be in L.A. In 1959 this 24-hour doughnut store was the site of the first gay uprising against police aggravation. ... and Now, the store was at 316 E. 5th Street. It was razed in the 1960s to make way for San Juan Park, a patch of Green in Los Angeles' skid row, below. The surviving building next to it at 308 - 310 E. 5th, the old S C Dodge building (it was just off to the right of the image above), has survived - it was the Florence Hotel back then and under the same name is now a residential building. Then ... She's now on W. 3rd Street at Figueroa. Lucas Union service station is across the street at 255 S. Figueroa, the neon-signed Fig Leaf Cafe at 833 W. 3rd is on the corner behind her and she's approaching Eddie's Loans at 831 W. 3rd. ... and Now, could this be the same place today? Yes it is! There goes the neighborhood! ... in 1955 ... This is the same block, daytime, as it looked when the movie was filmed. The Fig Leaf Cafe and Eddie's Loans are on the left. The boarded-up theater was the Lux. ... in 1956 ... Eddie's Loans also made a daytime appearance in Stanley Kubrick's noir The Killing. Then ... Now she turns from Main Street into W 3rd Street. Across the road we see the Gloria Cafe at 109 W. 3rd Street. She muses how she always wanted to marry in a church, have a nice house and raise four kids. ... in 1959 ... this vintage photo taken shortly after the movie was filmed gives us another look at the cafe. ... and Now, the building, above, has been replaced by another structure, below, currently housing an Immigration Services office at the 109 W. 3rd Street address. Architecturally speaking, class to crass. Then ... Yvonne crosses 3rd Street at the lower terminus of the Angels Flight funicular on Hill Street alongside the 3rd Street tunnel. Pregnant with her first baby, she wonders if he (Homer) will change for the better when he sees the child - she knows he likes kids. ... and Now, this corner too no longer resembles its predecessor after the 1960s makeover of the Bunker Hill neighborhood, although the tunnel is still in use. Then ... A steep set of narrow concrete steps scales the hill alongside the funicular. She climbs them and turns onto Clay Street to cross over the tunnel entrance. 3rd Street stretches out to the east below her. ... in 1970 ... Angels flight was removed in 1969 - this vintage photo was taken shortly after, coincidentally from more or less the exact same spot. The truck in the foreground is parked on Clay Street. Then ... She crosses over the tunnel on Clay and climbs a few more steps leading to the upper veranda of the Sunshine Apartments where her friend had a room inside at #14 (click image to enlarge). The friend's boyfriend is also on an all-nighter with the boys and since becoming pregnant Yvonne often sleeps over with her for companionship and security. To the left is part of the 'Hillcrest Hotel' sign next door. 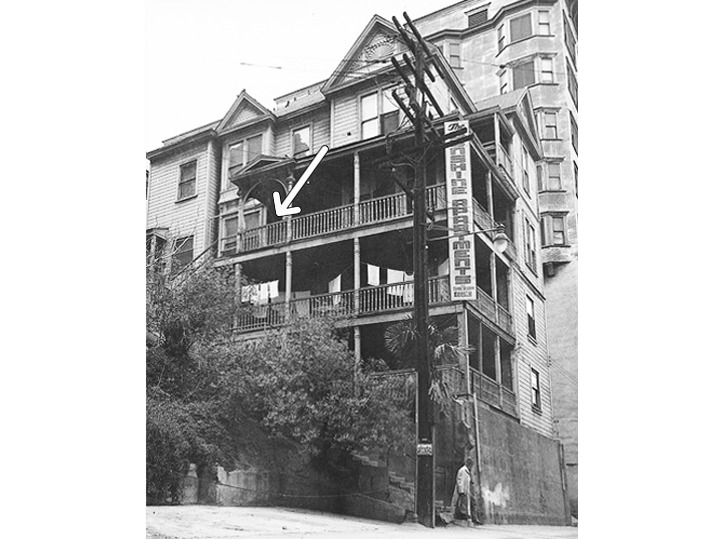 ... in the 1950s ... the arrow indicates that same veranda in this vintage photo of the Sunshine Apartments as viewed from Clay Street. The man in the right foreground is descending the steps that Yvonne took on her way to the apartments' entrance stairway. ... and Now, an office building now straddles the 3rd Street tunnel where Clay Street and the Sunshine Apartments used to be.